Karaoke is popular in Bend and many places host Karaoke nights a week. In Japanese, karaoke means "Empty Orchestra" and while that is a beautiful image, it is not entirely accurate. Karaoke DJs (or KJs) are the ghost in the machine, the voices, minds and nimble fingers of the vocal-less music you try to impress friends and strangers to. KJs summon the one song you just have to sing, and even though they have heard it a hundred thousand times, they do it with a smile, asking for nothing from you except a hopefully dry mouth. The karaoke machine was developed in the 1970s after advancements in storing audible materials in the 1960s. Even when initially rolling them out in Japan in the 1970s, it was seen as an expensive fad even as it caught on as an incredibly popular form of dinner-time entertainment. It is actually one of the few fads from the late '70s that not only has retained popularity over the years, but even increased in some parts of the world. While in-home karaoke machines are popular, it is the act of performing in a crowded bar for friends and strangers that really gives the form most of its art. Choosing the right song, playing to the mood of the room and making the song your own while retaining what people like about the original are all much trickier propositions than one might initially think. Rockin' Robin hosts karaoke five nights a week: Tuesday, Wednesday and Thursdays at Seven and Wednesday and Saturday at Kelly D's. I asked Robin how someone finds themselves in the KJ business and she told me, "I am a native Oregonian and have loved music all my life. I have sung in gospel bands, rock bands and have been exposed to all genres of music. I have three children and eight grand babies. And I love my life! During the day I am a hairdresser and at night I do karaoke. Sixteen years ago the KJ job just kind of fell in my lap in Redmond at Fireside Bar and Grill. I didn't have a lot of DJ music at the time and only their karaoke CDs so we were really limited at the time! Over time I got to buy new DJ music and karaoke discs. Soon, Kayo's opened so I was able to buy the necessary equipment to make a move and started doing karaoke/DJ shows over there. I knew eventually I wanted to be in Bend. I made a move to Bend six years ago to acquire gigs and it has been a positive move for me. Becoming an entertainer has been evolutionary for me, as in the beginning I was pretty shy. Now, it's in my blood to greet people and make them feel welcome at my shows!" 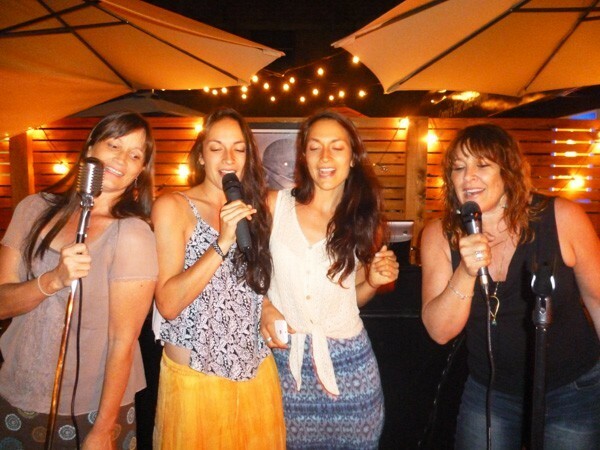 Bringing in karaoke nights seems to be all the rage in Bend right now. While most places only venture to have karaoke two or three nights a week, Cory's downtown has karaoke four nights a week which begs the question... at what point does a bar become a karaoke bar and does the karaoke bring in more customers than the bar would have otherwise. I asked Mike Hayes, the owner of Mavericks Country Bar, which hosts karaoke on Wednesdays, if he found that the karaoke night brought in a different crowd and he answered with much brevity "I find it's an increase to the current crowd." So, whether it brings in new people or just enhances the good time of the regulars, one thing is proven: karaoke is now more popular than ever. Jackie Johnson of A Fine Note Karaoke Too has been hosting at Soba's Alley Bar for the last few months until its abrupt closure last week. Because of the wealth of KJs in town, I asked Jackie whether it was hard for a KJ to find a new home after their main space closes down. She tells me, "It is hard to find new karaoke gigs in central Oregon. It seems like it is either feast or famine. For instance, on Wednesday nights, when I was doing karaoke at Soba, Corey's, Seven, and Kelly D's were all doing it that night. Yet on Friday nights, I don't think anyone is doing it. Luckily, I get quite a few private parties to carry me through when I don't have a regular gig. It's especially good around the holidays." People will always love to sing and most people will always love to sing in public. Karaoke is an outlet that not only gives people a brief and fleeting chance to shine, but also creates a communal experience over a shared connection to a song. Those connections are what we live for and Central Oregon's KJs are providing a lot more than Uptown Funk without the lyrics. They give us a safe space to be brilliant...if only for a few minutes.